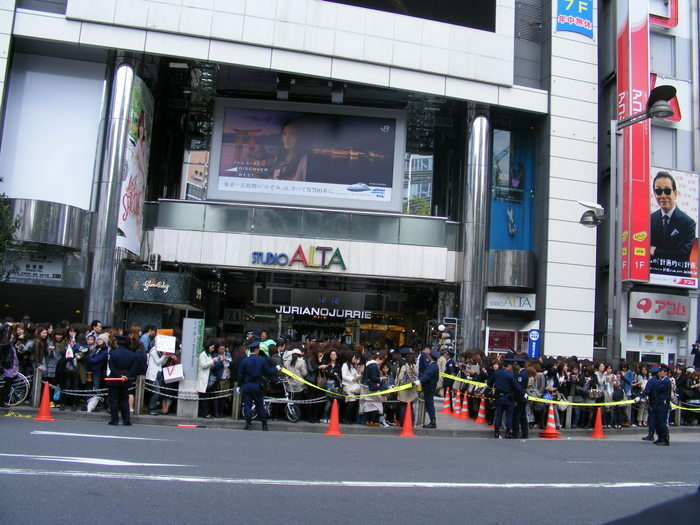 Another news on JaeJoong’s guesting in Waratte Iitomo. 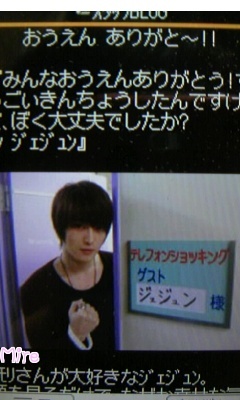 Jaejoong’s message to Eita was featured at Iitomo today when Eita appeared at Telephone Shoking. “Eita-san, your tension is low always. I don’t know what to do~. I want to talk to you a lot more~. Thanking you in advance~ (Korekaramo Yorosiku~)” by Jaejoong. 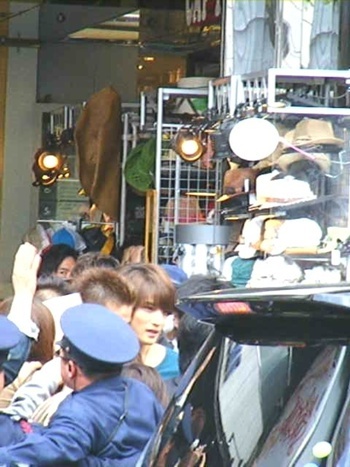 Tamori MC said that yesterday when Jaejoong appeared at Iitomo, police had to show up to guard at Alta/Fuji TV. 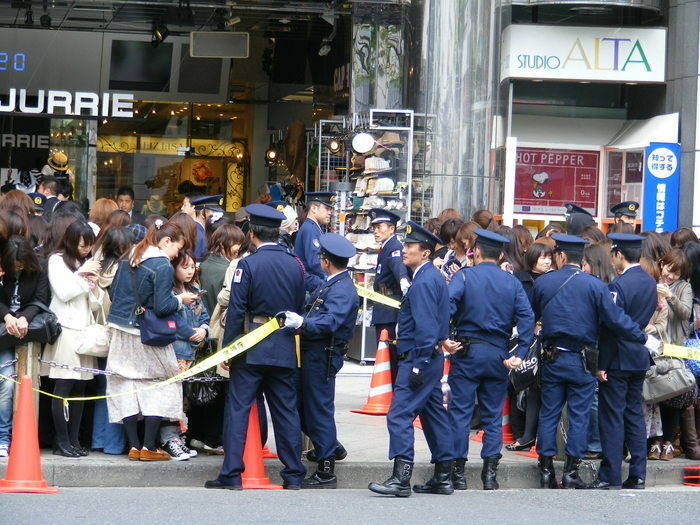 It does not happen normally and Tamori said he was surprised. Can somebody explain to me what he meant when he said that Eita’s tension is low? I really don’t get it. Did he mean attention span? Everyone thank you for the flowers and telegraphic messages!! look through it carefully later!! You guys aren’t expecting anything good coming out from SM, right? If yes, then that’s good because I don’t really want you to feel disappointed if ever you’re expecting beautiful words from those people. After announcing a halt on all Japan activities from the 3rd of this month, 5-man dance vocal group Tohoshinki’s Jaejoong, Junsu and Yoochun have announced on the 14th that they will be forming a new unit. The 3 of them have signed a new contract with Avex Management, and will start activities in Japan. As for the Korean Media, after news about the new unit broke, a representative of SM Entertainment said that as the exclusive contracts are still valid, to have such irresponsible and rash behavior without considering the lawsuit is “regrettable”. The 3 members in the new unit had disputed their unfair contract in July last year, suing the company that they have been with since their debut, SM Entertainment. In October of the same year, the court ruled for the injunction of contract terms*, effectively halting their exclusive contract. Meanwhile, on the 14th of this month, SM Entertainment filed a lawsuit against the 3 members to seek compensation on damages, further complicating matters. As for the 2 members (Changmin and Yunho) not involved in the lawsuit, and are still under the SM Entertainment, it is not clear whether they will be continuing activities in Japan under the Avex Management. Irresponsible and rash behavior? Rubbish. I’m sure the three members aren’t as stupid as SM to just do things when they know that it will have a negative legal effect on them. If I were Avex, I also wouldn’t sign those three if I know I can be caught on a legal problem if I sign them as my artists. I’m absolutely sure that they are smart enough to look at the possible implications of their actions unlike SM who often does and say things without a thought. I also think people at SM are forgetting that the courts have suspended JaeChunSu’s exclusive contract with them while the lawsuit is on going and they are allowed to choose their own activities without SM’s permission. Maybe this move by JaeChunSu and Avex is “regrettable” for SM because the company won’t have any share on the profits of the new unit. Now, that’s a really regrettable thing especially for a company like SM where money seems to be the only important thing in the world. TVXQ’s Changmin and SHINee’s Minho are dating? In the photo, Changmin is indeed in a performance area, he’s seated and surrounded by ladies but…the lady he is seen with is SHINee’s Minho! I still can’t stop laughing! It’s bordering on being funny and being stupid. LOL. 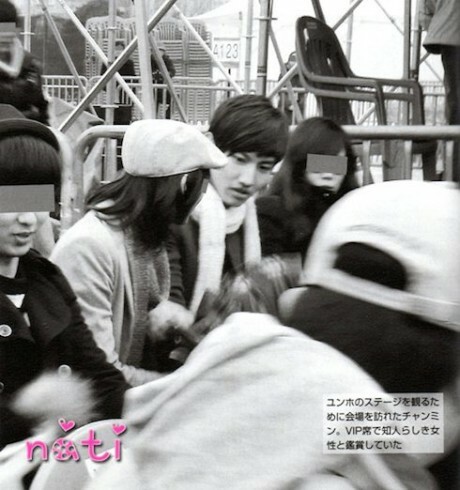 I wonder what would be Changmin’s reaction when he hears about this? The story of the MV is a bit common but it’s still sad, nevertheless. I was still left wishing that SooJin will find out (and she eventually did) that Yunho is just putting on a show when he showed up with a girl and that he’s really sick. I’m a sucker for happy endings so yeah, it would have been a disappointment for me if it didn’t end up the way it did. Hahaha. I saw this posted on Soompi and once I heard the audio and read the translations, my heart got broken all over again. my friend just shared this with me..
this was an audio recorded last month when jaejoong went out drinking alone and he got drunk (?) 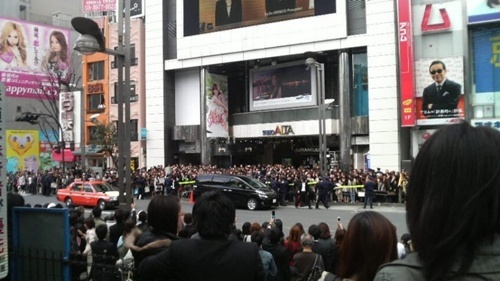 and fans called a taxi for him. Jaejoong Says Can I Be TVXQ Without Cassiopeia? 카시오페아 없음 내가 동방신기 하라고? 못해! Without Cassiopeia can i continue as Dong Bang Shin Ki? I can’t! i can’t live with Cassiopeia! *I think what the translator meant was “I can’t live WITHOUT Cassiopeia” instead of “with” since it fits more with the context of what JaeJoong was saying. I promised myself I won’t cry over this issue again because I wanted to be strong for the boys. I wanted to be someone who can give them strength and serve as their support in this trying time but after hearing JaeJoong’s words and especially knowing that he’s in a drunken state, all my defenses were broken down and my tears found their way out of my eyes again. Many things have happened ever since this lawsuit began. Many people have said a lot of bad things about the boys – calling JaeChunSu greedy and labeling HoMin as traitors. A lot of fans have kept the faith but a lot have also given up the fight and turned against the boys during this time when they needed our love and support the most. What’s even more heartbreaking is that even the fans who claimed to love them dearly during their “peak years” are also the same people who are calling them selfish, inconsiderate and uncaring now that the situation is turning to an undesirable direction and just because the boys are choosing to keep their silence on this whole ordeal. I understand if these people choose to turn their backs on the boys given the situation now but I really hope it would stop there. I hope they won’t say anything bad about the boys anymore and at least remember that these same boys had given them joy for 6+ years. To our eyes, they might have made a mistake in taking these steps but I hope we can somehow understand that they have a reason for doing everything they have done so far. I know we are all hurting from all of this and this pain is what (most of the time) triggers us to do and say unpleasant things that we might regret in the future but I hope we can also think about what the boys are feeling before we do or speak anything. If we are hurting this much, I cannot even imagine what they are feeling at this point. Their pain is probably immeasurable compared to ours. This audio clip certainly had proven how the boys are feeling about this. I cannot even explain how painful it is to hear JaeJoong’s words. For him to get himself drunk like this and more so do it alone speaks of how much everything is taking its toll on him. And his words… I just know these are words that come from his heart. Even at a time like this when I’m sure he knows that a lot of fans are losing their faith on them, he still declares his love for Cassiopeia.Even when a lot of people have accused them of being uncaring about their fans’ feelings because they aren’t doing anything to ease our pain, he still acknowledges the fact that without us he won’t be where he is right now. And even when everybody thinks that the members no longer care for DBSK, he still refers to himself as Dong Bang Shin Ki. Now my question is, are these the signs of someone who is greedy? Are these indications of someone who doesn’t care about the fans? Are these what an uncaring member would say? I guess not. No, definitely not. So I hope those who are saying unpleasant things to the members would take time to listen to this and contemplate. Even if you do not support them, I hope you’ll think twice before accusing them of anything. They are only imperfect humans who are bound to commit mistakes but we are not in the position to judge them of who they are as persons and treat them as if they have committed the gravest sin the world. Since we don’t have much news on Yunho these days, let me just post this message he left for a fansite.